I went garage saling today. A lot of it was overpriced junk, but I found a few gems here and there: a four-outlet USB charger for 25 cents, a couple nice picture frames for a dollar a piece, and the Robert Fagles translations of the Iliad and the Odyssey, which are renowned for not being as dull as dish water. 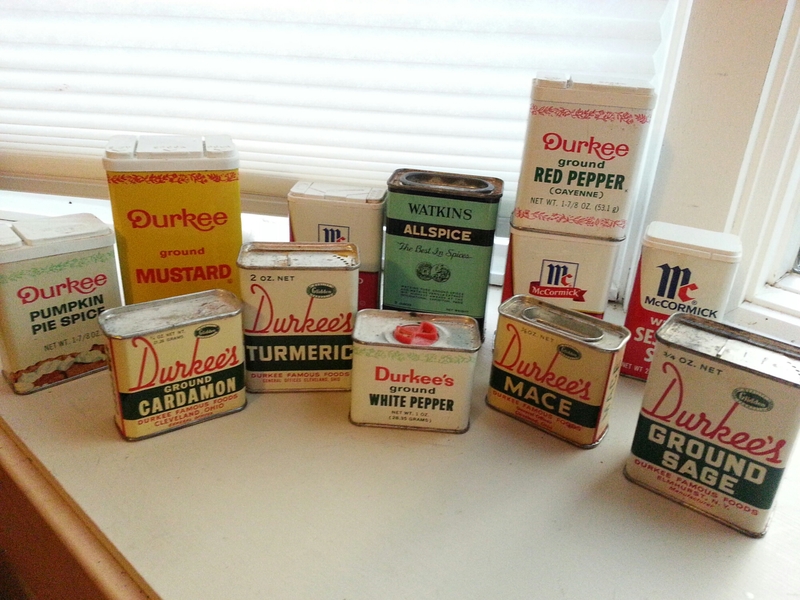 I also picked up these cute spice tins, which were thrown together in a gallon Ziploc bag. The whole bag was $2. I got them because I love having small tins to stow things like miscellaneous sewing supplies, ear plugs, and earphones, and these ones fit the bill of being both adorable and cheap. I could tell by the weight of the bag that some still had spices in them, but I assumed they would be so old they would be useless at this point. Then I got home, opened the bag and immediately began sneezing. The allspice, at least, has many good days left in it. Like any true garage saling experience, this one had its moments of sorrow, too. There was one horribe encounter at the beginning when a woman snagged a KitchenAid for $100 from out under my nose. Now, after the passage of several hours, I can calmly reason to myself that I already have a Vitamix, which mixes bread dough just fine thank you — or at least is supposed to do, though I’ve honestly never tried it. Also, it was probably one of those cheap, Target KitchenAids where the reviews complain about the motor burning out. Yup, I’m going to keep telling myself that. The curse of boot and garage sales!! I'm sure you're right... It was broken and she got stitched up! And besides, YOU got those tins.... I love tins....I'm now jealous of you! ? Ha ha! Yes, the tins are definitely better -- and much cheaper than the KitchenAid, too! I still have missed auction item regret from the mid 90's. Back then I was going to a lot of farm auctions and I let a portable metal punch get away without even bidding on it. I just watched and then after the fact realized "Wait, why didn't I bid?' Gone gone but then I just think of all the wonderful things I did acquire.